Lager frustrations solved – for now | LAGER FRENZY! Writing about beer from a business perspective is both fascinating and frustrating. Its pretty easy to spot that the fascinating part is reading about how beer and beer markets (and marketing) developed. The frustrating part is finding the necessary proof to back up all the fascinating parts. It wouldn’t be wrong to compare it to sitting in a pub and hearing a mildly drunken mixture of facts and opinion – only to wake up the next day and wonder which bit is which and who said it. 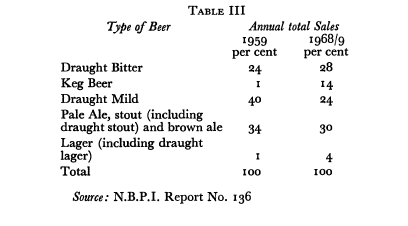 Which is why I’m particularly pleased this morning to present a primary source for the claim that lager made up around 1% of the UK beer market at the end of the 1950s and shows the relation to the other types of beers. The figure is widely quoted, but it has been tricky to find a named, authoritative source. And here it is. This entry was posted in Lager. Bookmark the permalink. This is fascinating for one other reason. It suggests that mild drinkers, not bitter drinkers, were the ones who switched to keg beer. If you read that into it, Barm, you’d be wrong. What was actually happening was that mild drinkers – the oldest generation – were dying out, so the decline in mild drinkers wasn’t because they were switching to lager, it was because they were now dead. They were being replaced by a new cohort of 18-year-olds who were refusing to drink what their dads did – bitter – or their grandads did – mild – and instead turned to the “new”, “exciting”, different-looking (and heavily advertised) drink, lager.